This web page gives only a partial list of the shared resources used by mechanical engineering faculty and students. Equipment in individual faculty laboratories has not been included. 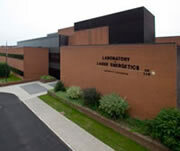 The Laboratory for Laser Energetics (LLE) of the University of Rochester is a unique national resource for research and education in science and technology. The laboratory was established in 1970 as a center for the investigation of the interaction of intense radiation with matter. The new research facility for investigating inertia confinement fusion is a result of a seven year effort with a total investment of 61 million dollars. The combined energy of the lasers in this system can deliver more than 40,000 Joules of energy on a target less than 1 mm in size in approximately 700 picoseconds. This equates to approximately 60 TeraWatts or 100 times our national electric generation capability! A variety of optical manufacturing and metrology equipment is available on campus and through access to nearby companies. OSX 50 Machining System (Located in ME Precision Optics Fab Lab): This is a computer-numerically-controlled (CNC) optical machining system with five controllable axes: X, Y, Z, B & C and up to 5 axes of simultaneous movement. The Fagor 8070 CNC machine controller is programmed through a high-resolution LCD touch screen monitor. 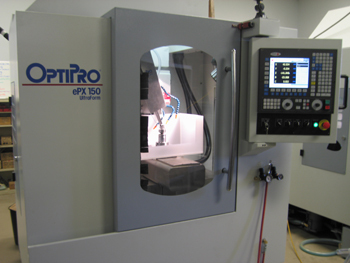 Capabilities include machining/grinding of plano optics, spheres, and axisymmetric aspheres. 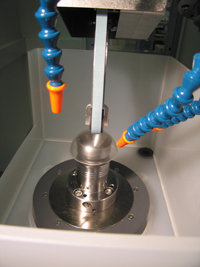 The system is based on bound abrasive metal-bonded cup tools. Tools can be used in machining or contouring modes. Materials that can be machined include optical glasses, optical ceramics, and stainless steel injection mold inserts. Ultraform Finishing (UFF) System (Located in ME Precision Optics Fab Lab): This is a computer-numerically-controlled (CNC) sub-aperture polishing system, with five controllable axes: X, Y, Z, B & C and up to four axes of simultaneous movement. The Fagor 8070 CNC machine control is programmed through a high-resolution LCD touch screen monitor. Capabilities include finishing of plano, spheres, and aspheres as well as freeform optics. The system is based on a moving belt wrapped around a precision compression wheel to polish material with at least ¼-wave accuracy, using either bound or loose abrasives. Materials that can be finished include optical glasses, optical ceramics, and stainless steel injection mold inserts. Additional optical manufacturing facilities are available within the Robert E. Hopkins Center for Optical Design & Engineering located in the Goergen Building within the Haijm School of Science and Engineering and within the Optical Fabrication Shop located at the Laboratory for Laser Energetics. These facilities include optical fabrication and metrology machines, such as a QED Q22-XE magneto-rheological finishing machine and a Zygo NewView and Mark IV Interferometers. This major, new, x-ray analysis laboratory is intended for microstructural characterization of materials including x-ray investigation of thin-film epitaxial layers, MBE stacks, textured films, bulk polycrystalline materials, residual stresses, automated powder diffraction patterns, near surface layer damage in processed materials, etc. The lab was funded by NSF, Division of Materials Research, Major Research Instrumentation grant and the University of Rochester with equipment donations by Bausch & Lomb and Philips Analytical. The new instruments are: a very high resolution Materials Research Diffractometer, MRD, PRO and a Multi Purpose Diffractometer, MPD. Both diffraction instruments are run with Philips, X'Pert Systems software. The x-ray analysis laboratory was introduced to the university community and materials science professionals in the Rochester area in fall 2000. An MTS Nanoindentor XT is available for scratch, friction and surface profiling. This advanced device combines both ultra-low load indentation and microhardness testing. One application is characterization of glass mechanical properties under the low loads experienced in fine grinding and finishing operations in an effort to determine removal mechanisms. Additional experimental facilities include scanning, atomic force, and optical microscopes, servohydraulic and screw-driven mechanical testing systems, spectrophotometers, a hot isostatic press, and melt-spin and other small-scale fabrication facilities. Equipment for powder characterization include a Jenike shear cell, annular shear system, moisture analyzer and humidity chamber.